~ Transmitting, crafting, contemplating, being. Last week, I had the very special opportunity of attending a personal guided showing at the National Library of Israel of a Renaissance-Italy, illuminated scroll. Timna Elper, head of the Conservation Department of the National Library of Israel spent quality time showing me the most beautiful and most pride possession of the Library: a Megillat Esther from Ferrara, Italy dating from 1616. Alexander Gordin, on staff of the Rare Books Department brought the Megillah to the restoration laboratory in a special trolley for viewing. The Megillah is inscribed at the beginning with a statement of ownership from the individual, who commissioned the Megillah: Mordechai, son of Eliahu HaLevy from Brescello. The Megilla was written and The parchment scroll is 26 cm high. This script is Sefardic style and if the ink were not subtly dimmed due to it’s date of origin, or there were not stains on the parchment, I would think that that this was written recently.illustrated by Moshe ben Avraham Peshkarol in the city of Ferrara, Italy. This magnificent Megillah is artistically decorated with beautiful ornaments of Italian Renaissance style all throughout its 4.29 meters length. The excellent condition of the Megillah, and the brilliance of its colors would also misguide me to think that this work is contemporary, but a 17th century replica. The imagery that is used to decorate this Megillah is a portrayal and depiction of the Biblical story of Esther. The illustrations are laid out in the borders and coincide with the progress of the text all throughout. There is a consistent pattern that repeats in the artistic layout. On the sides of each panel of text is a thin, 45 mm wide strip of a floral motif. At its base is a 45cm x 45cm square illustration of either a bird, animal or flower. All tops of these floral strips that divide the columns of text comprise a man wearing a turban. To me, this man looks kind of like a genie emerging from a flowerpot. The bottom of each column of text and extending its width is an ornamental floral vine and at times dappled with an angelic figure. At the top of each column is an embellished depiction, an element from the Book of Esther text of that particular column… and the story is told, the Gansen Megilleh. It is said that a picture contains a thousand words. Each and every illustration of this exquisite Megillat Esther brings understatement to this saying. The graphics do not only tell us about the story of Esther, but they also tell us about what the Jews of 17th century Italy thought about the story of Esther. This Megillah, and like it, all other decorated Megillot serve as legitimate interpretation or Biblical commentary in its own right. 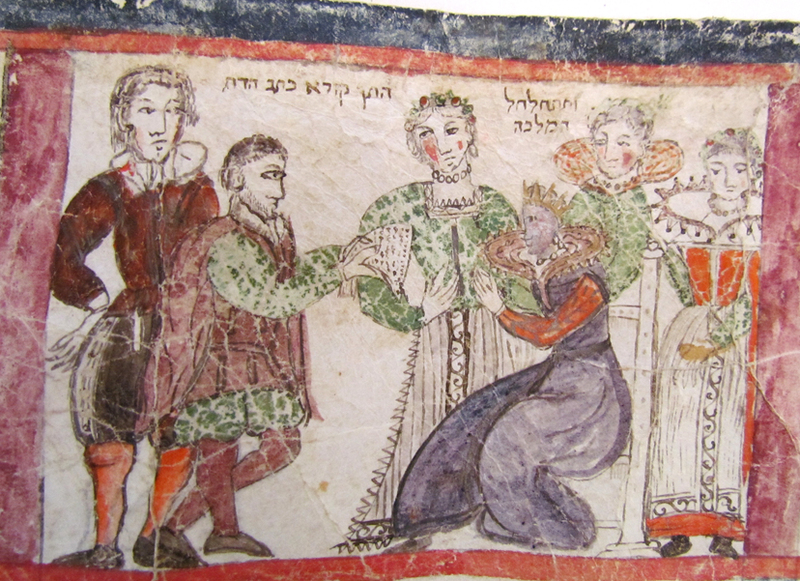 The artwork of this Megillah also tells us about Jewish life in 17th century Italy. The illustrations do depict the characters and events of the Biblical Book of Esther, however, the clothing, appearance and customs are not of 5th century BCE when the story of Esther took place, rather they are of the time and place in which the artist lived – Renaissance Italy. This Megillat Esther is, but not limited to a 17th century scroll serving the purpose of Jewish ritual, rabbinic tenet called “Mikra Megillah,” “Megillah reading” of that time. This particular Megillah is not merely part of the broad fabric of Jewish Biblical interpretation. This Megillah is also an important historic document. In many ways like the Talmud, this beautiful Megillat Esther from 1616 Ferrara, Italy is part and parcel of the Jewish oral tradition. Like the Talmud, this Megillah is a vehicle or conduit of the oral tradition. The oral tradition is a live, organic entity. Although the Talmud was written down, it is still ever growing and developing. Oral tradition is not limited to time and place. Megillot like this are written in a specific time and place, which form the perspective of the people living then and there. However, like the holiday of Purim itself, there is a transient link, a kind of time-tunnel that connects the generations. The laws, customs and core values associated to Purim that are sourced in the Talmud and earlier, in the Book of Esther are the matrix, the web that links all Jews of all times and place. A happy, joyous, gut and freilich Purim! Story and images by Jamie Shear, courtesy of Israel National Library.